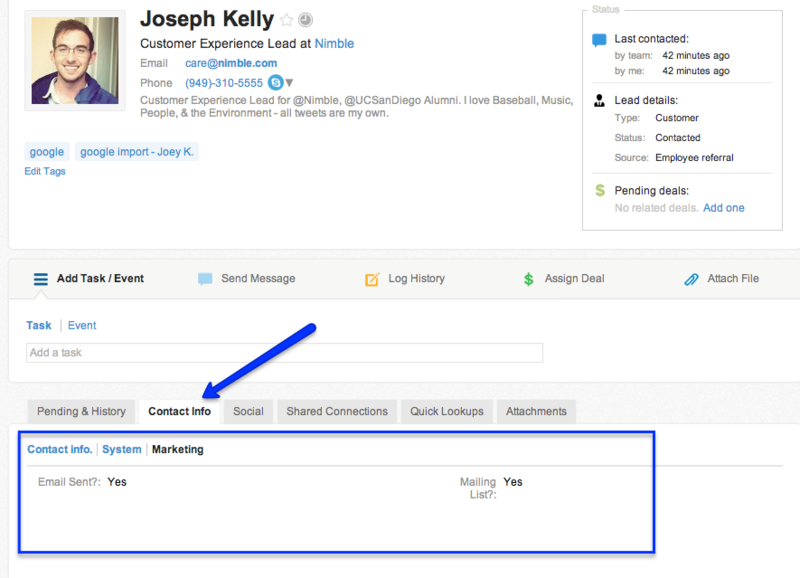 Use custom data fields in Nimble to collect data about your leads and customers that is unique to your business needs. Currently, custom data fields are only available for contact records (people & company records). We plan to add custom data fields to deals in the future. Note: New custom fields cannot be added to the existing: "Contact Info" or "Other" tabs in your contact records. 2. 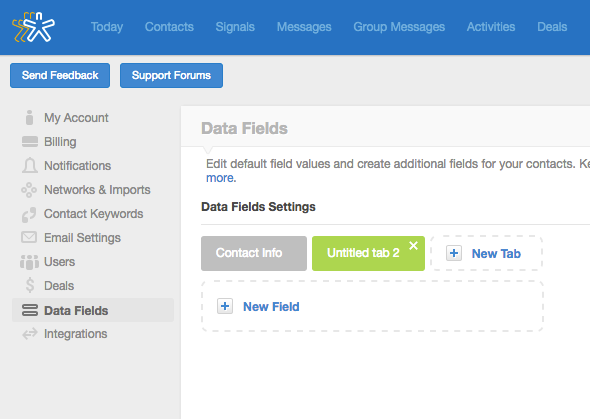 Select "+ New Tab" to create a new section to host your custom data fields. 3. Label your tab: This is the name for the tab that will host your data fields(i.e.. Marketing, Accounting, Sales). Note: You may decide to display this tag in "All Contacts" "People" or "Companies". 4. Select Apply Changes after you have named your tab. Once the tab has been created, you may add your data fields. Click on + New Field. On the right, under "Field Settings", label your field and determine the field type. Once the field type has been chosen, it cannot be changed. 6. Adding Additional Fields: Repeat step 4 to create more fields (+ New Field) for the same tab. Move your cursor over any field entry and "drag and drop" to re-arrange the order of the fields. 7. To create additional tabs for custom fields, repeat steps 3-5 to add new tabs and fields. Once you have finished creating these custom tabs and fields, you may go to your contact records to see them. Note: These custom tabs and fields will only appear under Contact Info subtab if there is data stored in them. If your fields are currently empty, you will only see them from the "Edit' view. 8. To populate information into a custom field, select Edit on a record, and fill in your data. You may also bulk-update custom fields via CSV import. 9. Here, you can see the tab(s) you created. Select one of them and enter data in the fields. Press Update. 10. Click on "Contact Info", and now your custom tabs and fields are displayed. Repeat steps 7-8 for the other tabs to show.